Before Ellis Island, immigrants entered the U.S. through Castle Gardens in the New York Harbor. As the illustration shows, the feel of the place was neither “castle” nor particularly “garden.” First built as a fort to defend the harbor from the British in the War of 1812, the facility became a public cultural center and theater when the British were our pals and trading partners again. In 1855, Castle Gardens was transformed into an immigrant receiving station. Irma entered America here. By 1890, eight million Americans had come through Castle Gardens, mostly from Germany, Ireland, England, Scotland, Sweden, Italy, Russia and Denmark. An estimated one in six of us are descended from someone who passed these gates. My great grandmother entered here, 16 years old and alone. 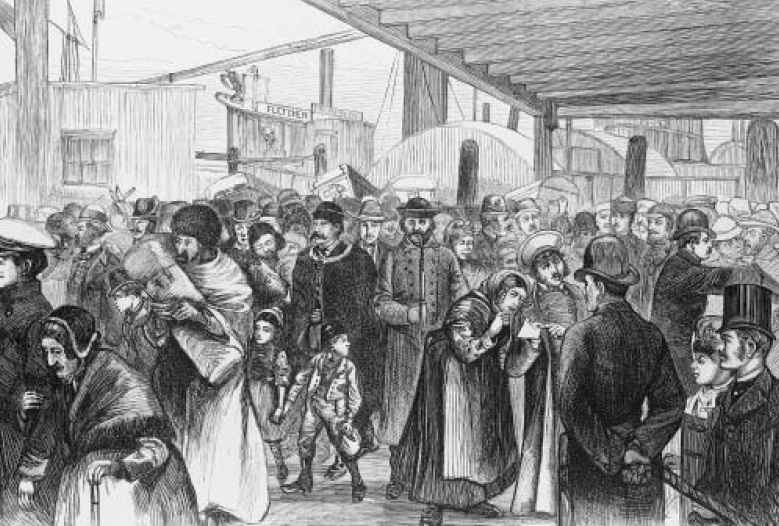 It is possible to search free for entries between 1830 and 1890 or for a fee at New York Passenger Lists, 1851-1957. The point was speed and sifting. Immigrants who might become a public charge were shunted back to their ship captains to be hauled home. Those headed out of New York were processed onto trains as quickly as possible since there were no overnight facilities. As you see on these faces, people entered Castle Gardens with much of the dazed exhaustion visible at passport control in today’s international airports. By today’s standards, these were largely “undocumented aliens,” presenting themselves at the border with some minimal proof of identity and nationality, a destination, however vague, and willingness to work. ‹ 10 Notes on the National Park of Abruzzo, etc.